We had a long drive from Vermont to the Syracuse Camping World for a diagnostic appointment for our side camera that had been damaged. We hoped to get it submitted to our warranty company, then drop the MoHo back off for the work to be done later in the week. It was a bit of a cluster and 2.5 hours later, we hooked back up and drove the 45 minutes to Cherry Grove Campground in Wolcott, NY. It was a smaller park with what seemed like a lot of seasonals who park their rig, then come back to it on the weekends or for vacation. It was Monday, so even though the park was fairly full, no one was there. The owner couldn’t have been nicer and already we had a much better vibe than the last place. One interesting thing that we have never encountered is that they charged $3/day for A/C usage. The park was so reasonably priced, this didn’t bother us, just interesting. It had been a long day, so we just “kenneled” in for the night. 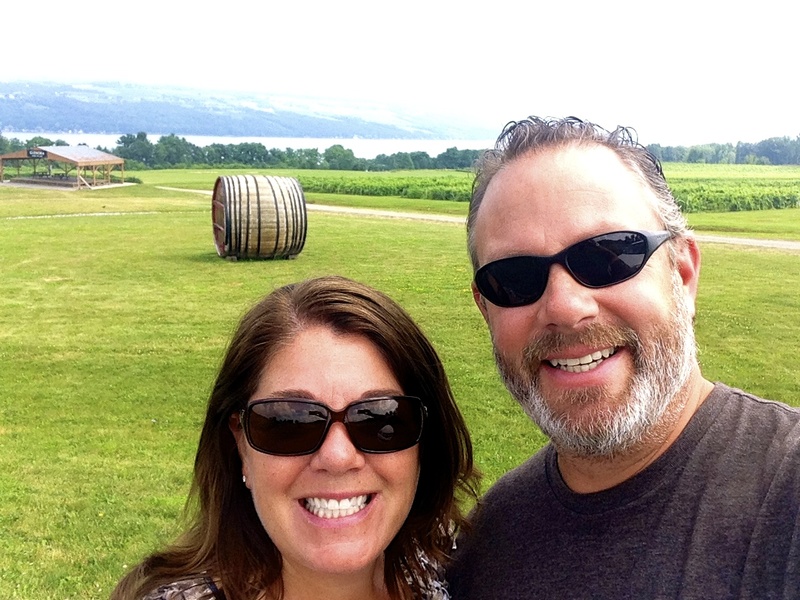 The next day, we set out to explore and check out the Finger Lakes region, which is full of wineries! Who knew? This wasn’t even on our radar as we had mostly picked this stop to get the RV maintenance done. We decided to focus on the west shore of Seneca Lake and just randomly picked our first stop, White Springs, which was a wine/brewery combo. The next stop was at Billsboro, and we had a fantastic young gal helping us who gave us some great recommendations for the rest of the day. We made it to 3 more plus a stop for a delicious lunch. Glenora had great views, Hermann J. Weimer was our favorite and we had a good chat with the very knowledgeable pourer and our last stop, Anthony Road, was just ok. This area is really known for its Rieslings, which is not our favorite, but we did enjoy the drier ones, especially since it was a hot day. 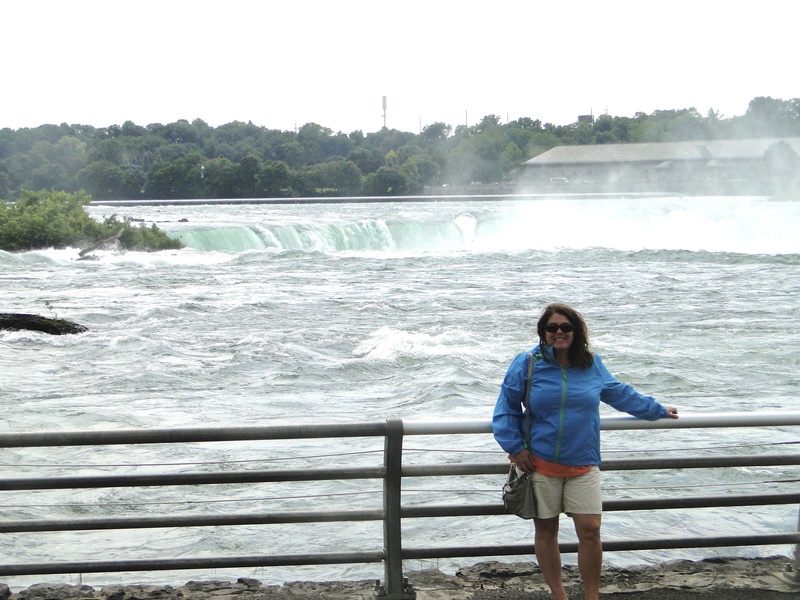 We would love to return here when we have more time, as there are more lakes with many more wineries to explore. 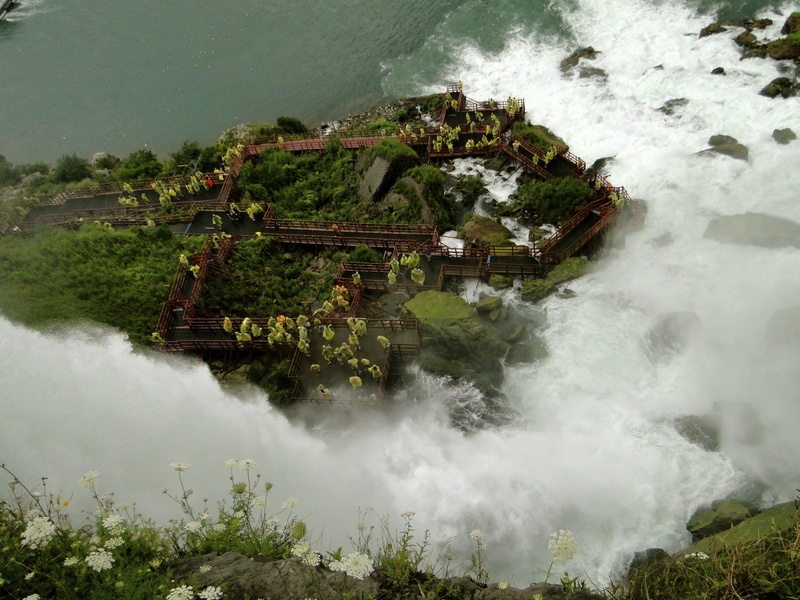 It kind of had a Lake Chelan feel, but on steroids! 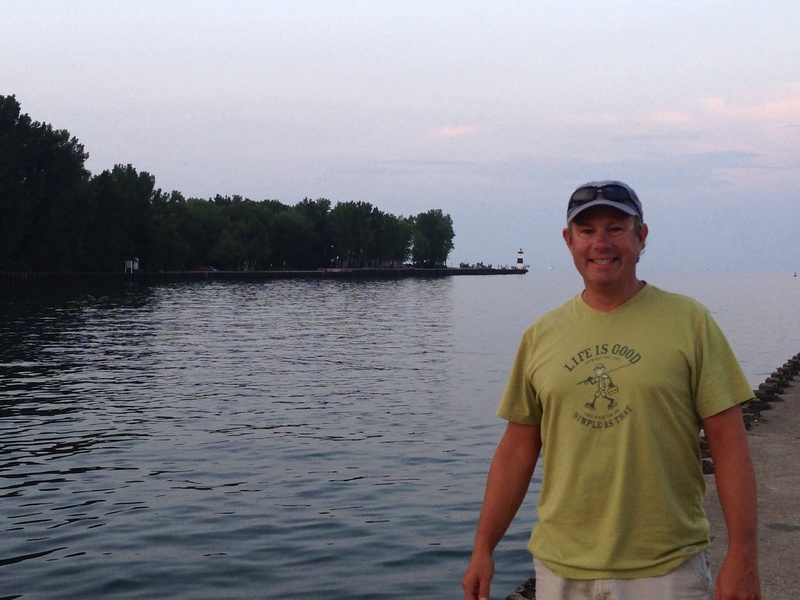 On our last day, we decided to head to Fair Haven Beach State Park on Lake Ontario. The weather wasn’t great, but our goal is to at least dip our toe into all five of the Great Lakes, so this was our first. We walked around the park area, did our toe-dip, then had a picnic lunch looking out at this huge ocean of a lake. The wind really started to pick up, so we packed up and headed back to the MoHo. We were supposed to drop it off back at Camping World in the morning, but since we had yet to hear back from our warranty company and CW was not responsive, we canceled. We have come to the conclusion that our warranty company is a complete scam as we have never had any luck making contact with them let alone with them approving a claim. This is a long saga that we are both completely irritated with, so our next step is to cancel with them and find another company. We were set to drive to Philadelphia in the morning for our flight to Seattle (see previous blog), so now we had nowhere to leave the MoHo. 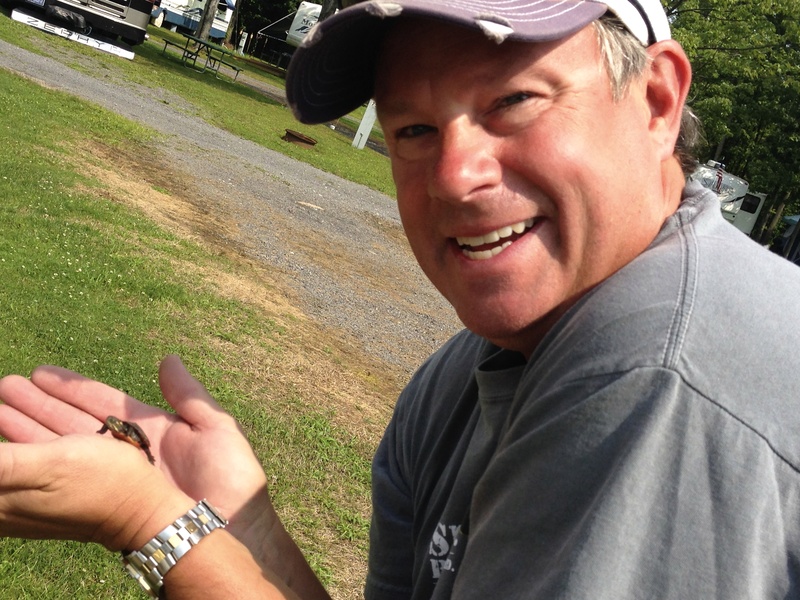 Mike checked with our campground and they were willing to let us leave it there and plugged in for only $6/day. Awesome! We had an outstanding trip home to Seattle and successfully surprised our friends at the annual Camp Cameron Pool Party. 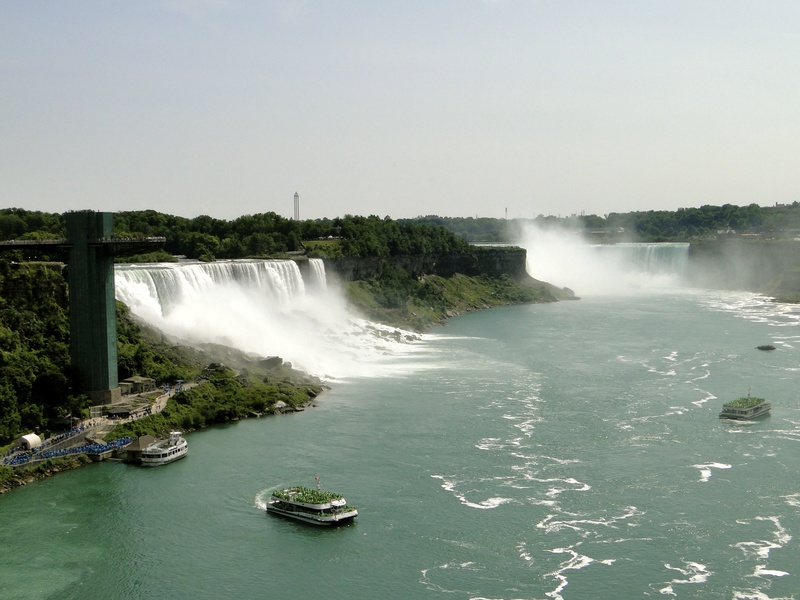 We left the campground in Wolcott on Wed. the 30th and made the drive to a KOA on Grand Island, NY just 7 miles from Niagara Falls. A friend, Sandy and her husband Gene, who we had met in Everglades City, FL in January were working here for the summer, so we were excited to see them. We got settled and did a much needed grocery run, and prepared for the monsoon weather about to hit. Sandy came over that night and we split a few bottles of wine and had a great time catching up on the past 6 months. 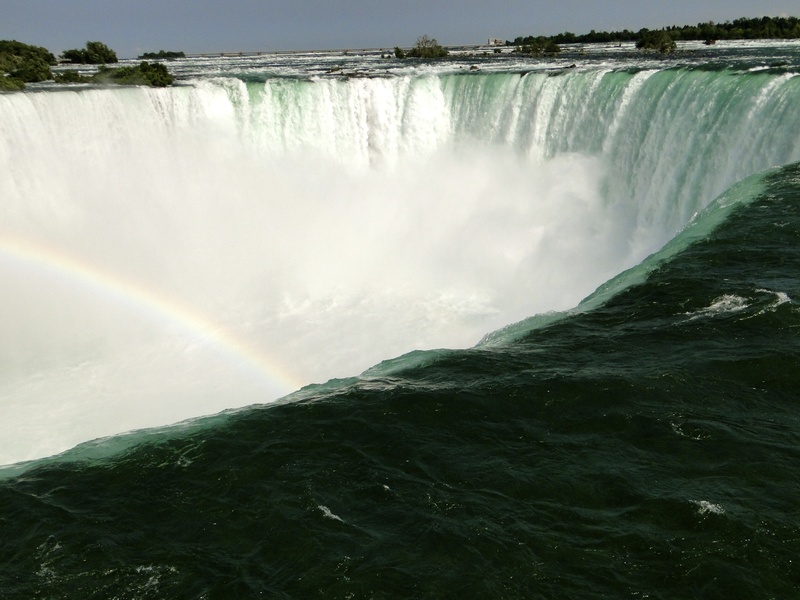 View looking down Horseshoe Falls – feel the power! 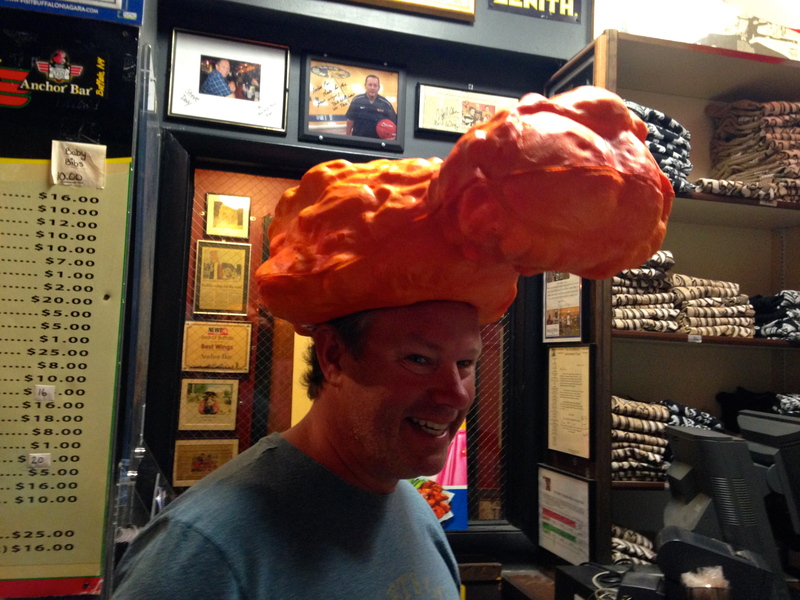 Since we had knocked out our must-sees of the area, we weren’t quite sure what to do the next day. Decided to head into the Niagara Falls Wine District. 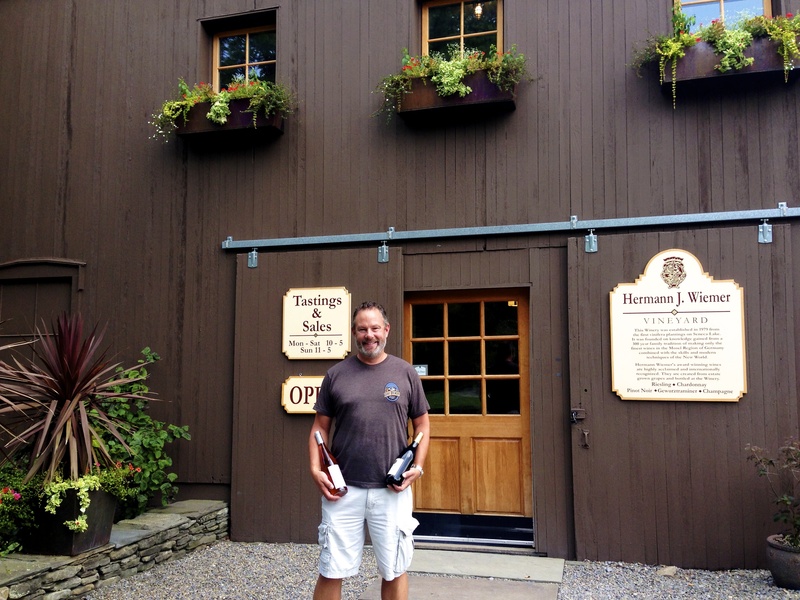 We hit 4 wineries and learned that this area is still developing and working on their niche. We did try some ice wine (I didn’t really care for it) and we were told that the neighbors to the north in Ontario are really the ones doing it right. It is quite an expensive and arduous process to produce and they are still working to master it. We got back to the MoHo and ended up at Sandy and Gene’s RV sitting outside chatting for the next 6+ hours. We ordered pizza and had a great evening and really hope to meet up with them again sometime this winter. 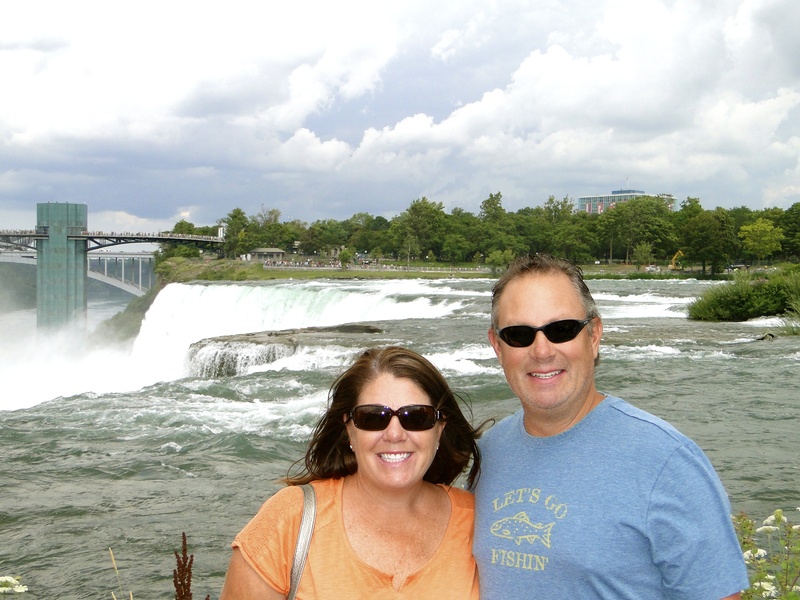 We said our goodbye’s the next morning and got on the road to Erie, PA. We found a great spot right on Lake Erie, Lampe Marina Campground and the price was right at $30/night. We originally were looking for a place closer to Pittsburgh, but we just couldn’t pass up this spot. The big city of Pitt will have to be another trip. This was the most relaxing stay we have had in a long time. We used the bikes everyday and really just enjoyed the setting of the park. 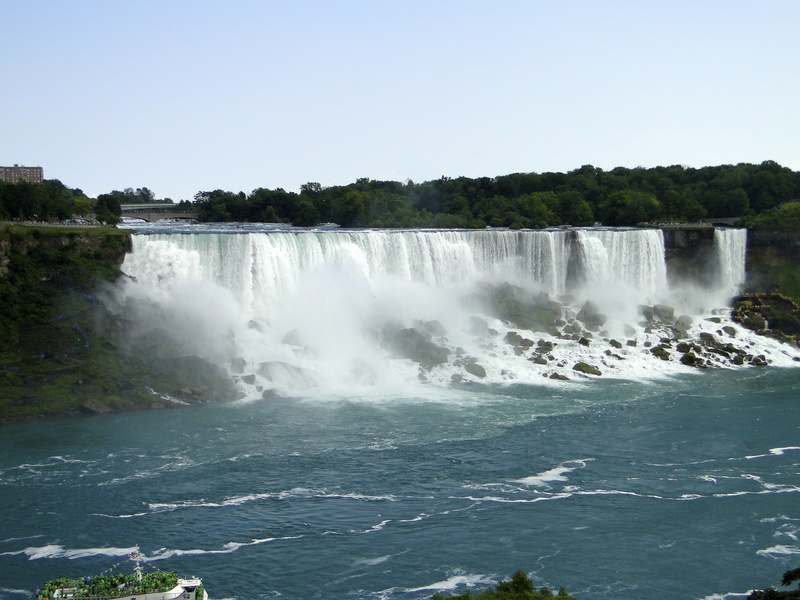 In fact, we didn’t spend a penny other than the cost of the park for our 3-day stay, making all meals at the MoHo. There was a long pier out from the marina area where fishing was the main attraction and lots of boat traffic into the bay. We had a big thunder and lightning storm the first night, which was kind of cool, but the rest of the time was nice. 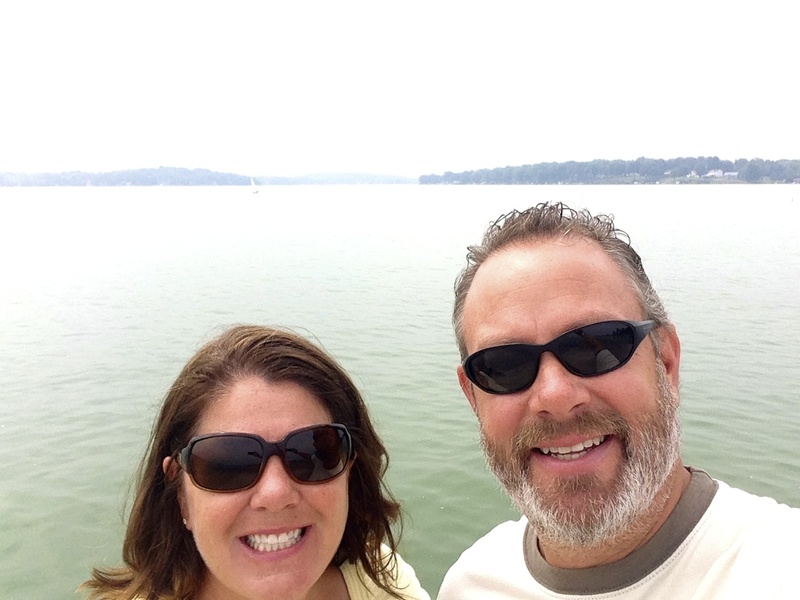 On our last day, we loaded our bikes in the car and drove 30 min’s to Presque Isle State Park. From the campground, we were only about a 50-yard water crossing, but to get there by land, we had to drive the long way around. 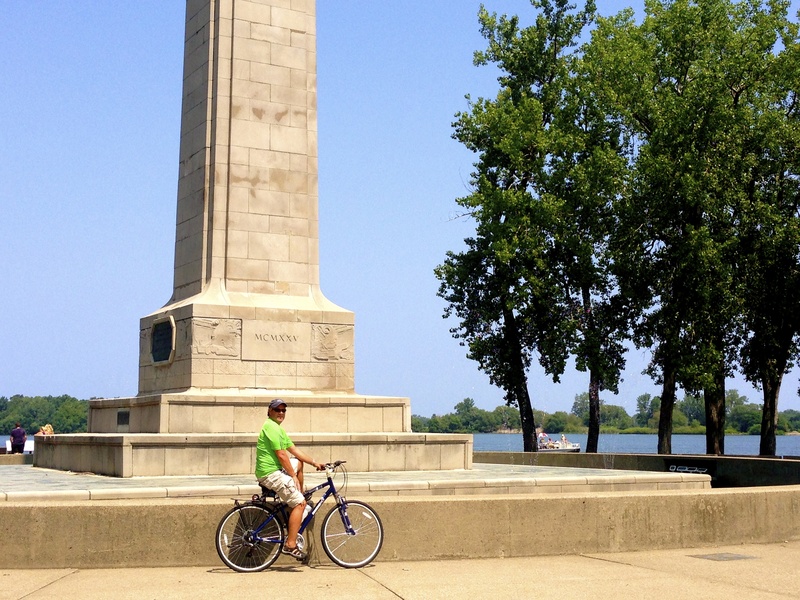 The park is a 3,200 acre sandy peninsula on Lake Erie with a 13-mile loop and many hiking trails, fishing spots and sandy beaches. We parked at Beach #8 and set out on the loop on our bikes. It was bit toasty out, but the trail had many shady spots and great viewpoints to check out. We made it out to the point where we could look back and see the MoHo just a short distance away. Back at the car, we loaded the bikes back in, changed into our suits, grabbed the cooler and chairs and walked out to the beach. The sand was dark and a bit gravely, not the white powder you would find at an ocean beach. But, other than that, it seemed like the ocean. 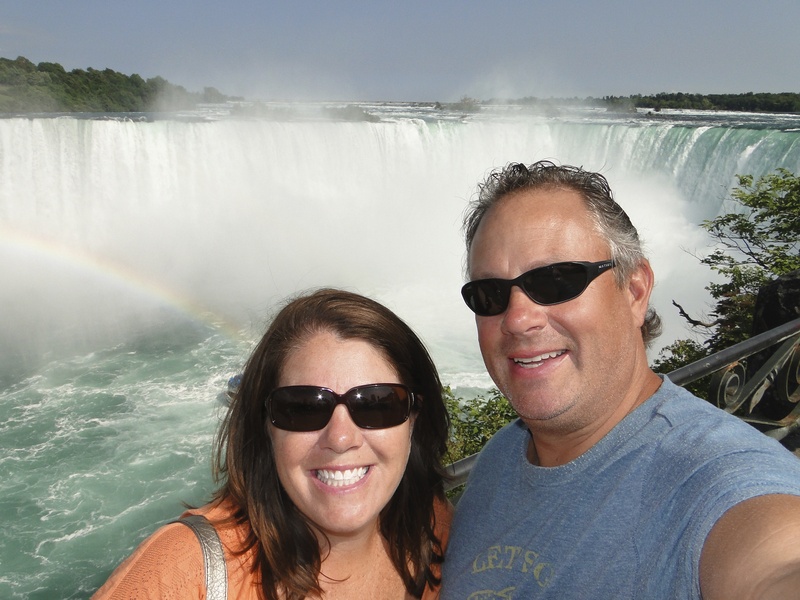 It was pretty crowded, but we found a spot, had our lunch and took a dip (#2 down of the 5 Great Lakes!). We hung out for awhile and were both cooked, so packed it up and headed back to the car. Drove back to the MoHo and enjoyed our last night at this park complete with campfire and Mike cooking ribs. Off to the Cleveland area in the morning. 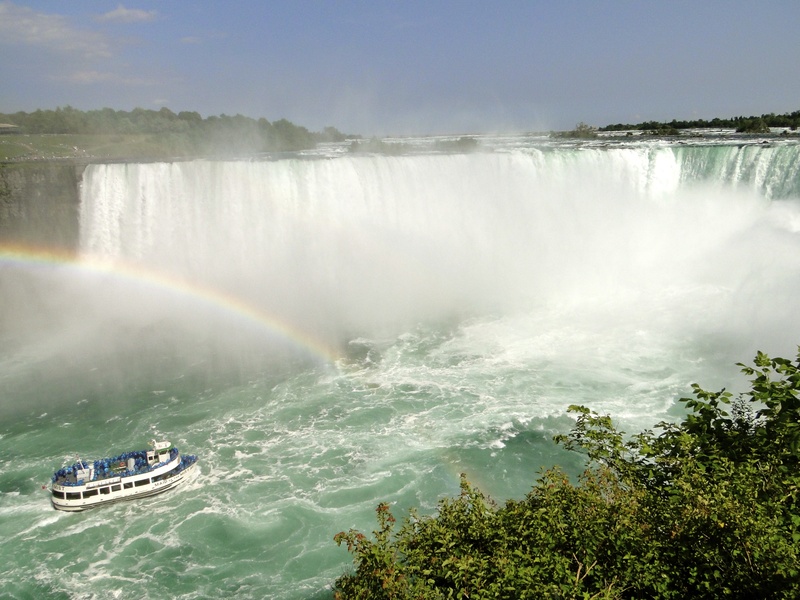 Great Lakes factoid: The Great Lakes contain 21% of the world’s surface fresh water and 54% of the world’s liquid fresh water by volume. These lakes are HUGE! 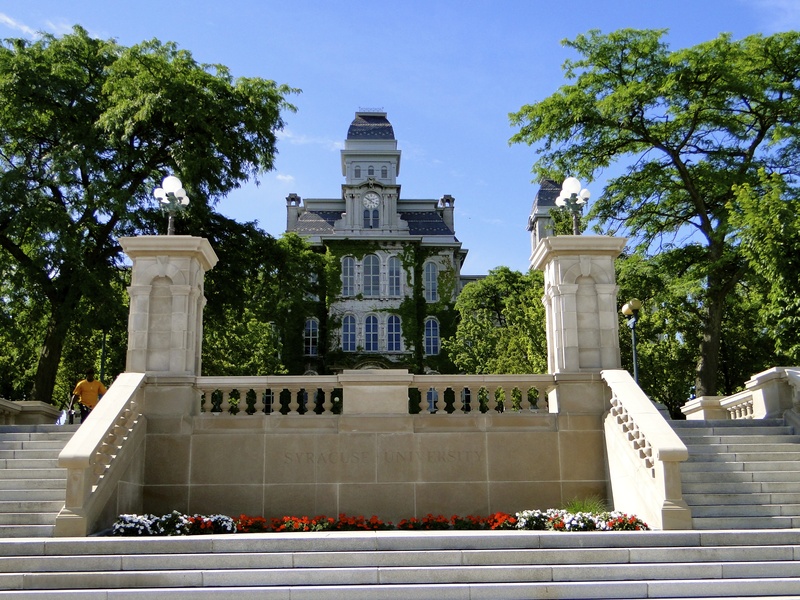 This entry was posted in August 2014 and tagged Anchor Bar, biking, Chicken Wings, Finger Lakes, Lake Erie, Lake Ontario, New York wineries, Niagara Falls, Presque Isle State Park on August 6, 2014 by Traci. Driving out to Cape Cod felt a bit like driving down to the Keys in Florida. It is an island more or less that has one main road in and out. I had always heard of Cape Cod but was never quite sure where it was. Now I know! It is the very southeastern point of Mass which made for a short drive from Newport, RI for us. 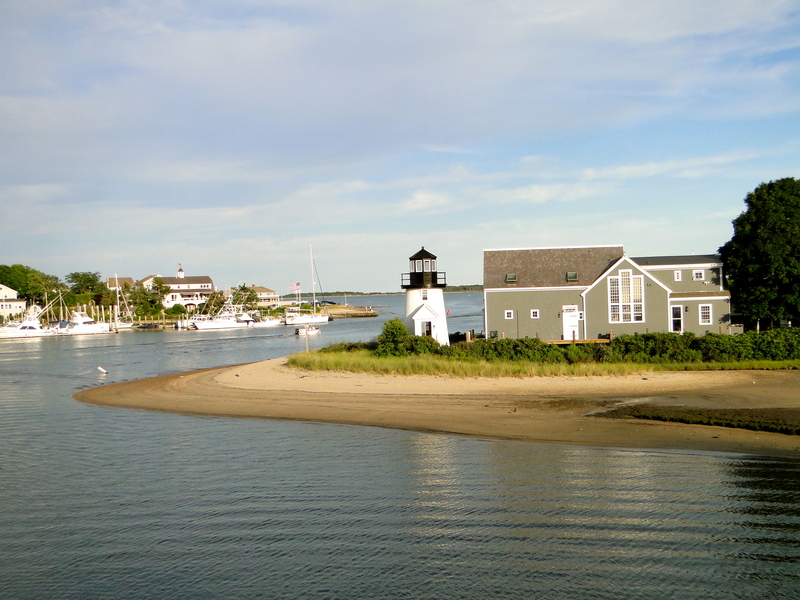 Our campground was in the town of Dennis Port on the southern side of the Cape, right on Nantucket Sound. 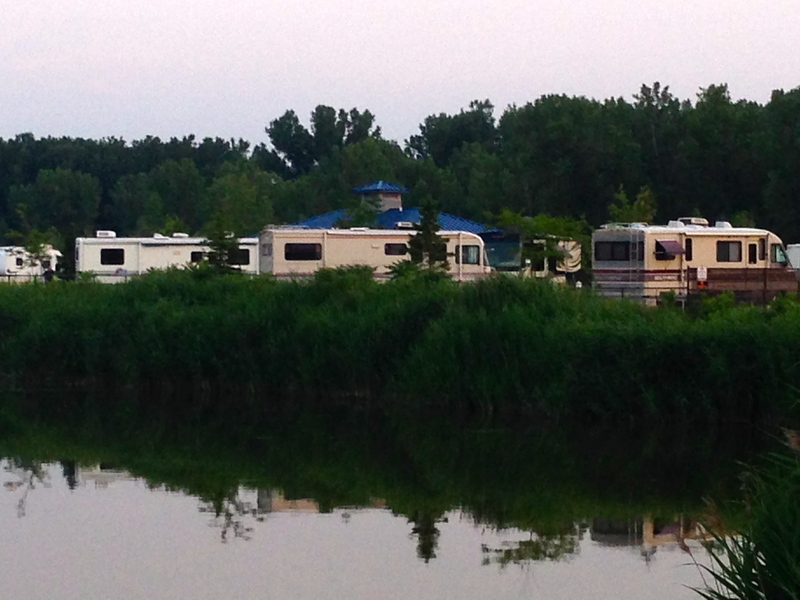 Campers Haven Campground catered more toward its full-time trailer residents than part time visitors like us, but the location just couldn’t be beat. We quickly got settled, then decided to make the drive up to Provincetown (P-town), all the way to the tip of the Cape or Upper Cape as it is called. We parked, then just walked up and down the main avenue, Commercial Street. It was pretty busy with tourists crisscrossing the streets, kids eating ice cream, bicycles whizzing by and musicians playing on street corners. A very cute, liberal little town. Apparently, this is where the Mayflower originally landed before heading to Plymouth. Someone had given us the tip to come here back in Everglades City, FL and we are glad we took them up on it. We made our way back down Hwy 6 to Dennis Port and stopped in at Clancy’s for dinner for a great meal and view and even better service. Back at the MoHo, we took a quick bike ride out to the water, then battened down the hatches for the coming rain. Thursday was the U.S. vs. Germany soccer match, so we started the day with breakfast and mimosa’s. It was pouring rain outside, so we didn’t feel too guilty. We lost to Germany, but with the Portugal win vs. Ghana, made it the next round. Pfew! We ended up not leaving the MoHo the whole day. This is a rare occurrence, but with the rain and soccer on, we decided to just have a day to relax. Got a few projects done, caught up on bills, etc. I need to remind myself that we don’t have to be on the go every single day. Felt great to have a day like this! 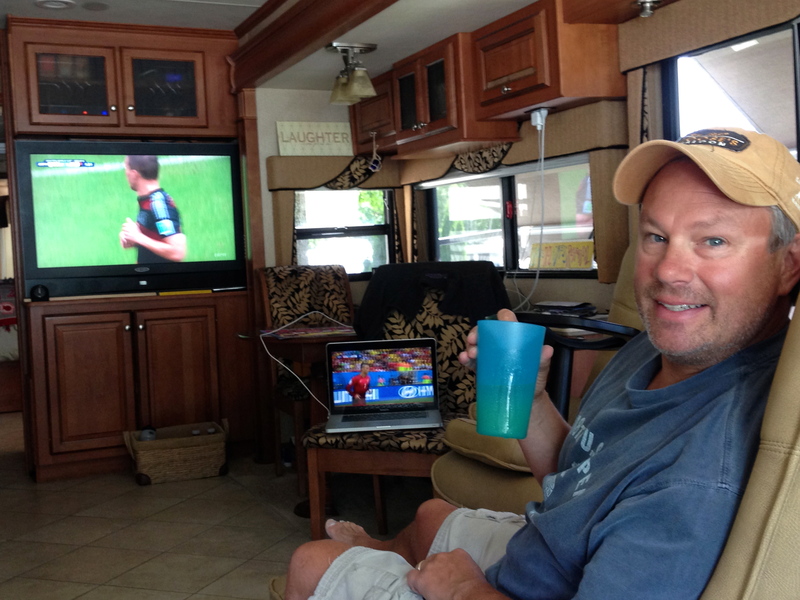 World Cup command center, watching 2 games at once! 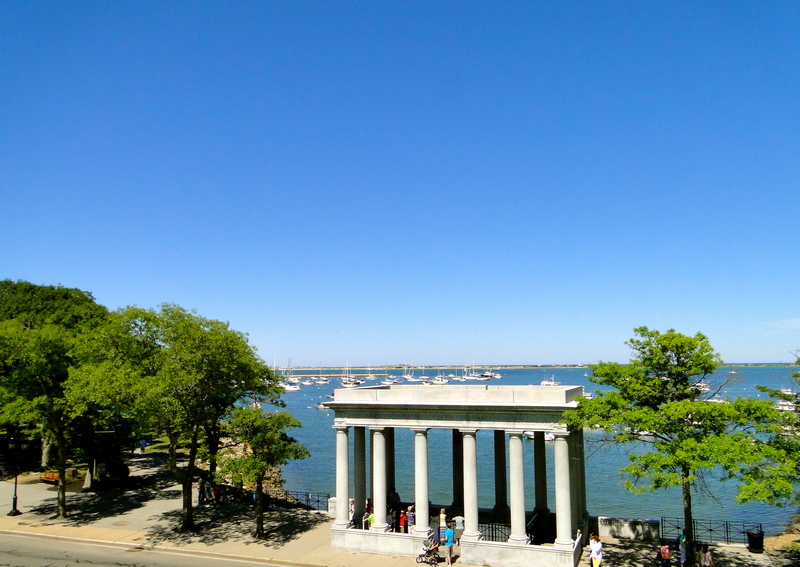 The next day, we decided to make the trip north to Plymouth, located off the Cape closer to Boston. First stop was at the local visitor center and we got a very helpful lady who gave us the lay of the land. It is a fairly small town, with most sights within walking distance. There is a main street at sea level then the town kind of tiers upward, so each street looks out toward the bay. 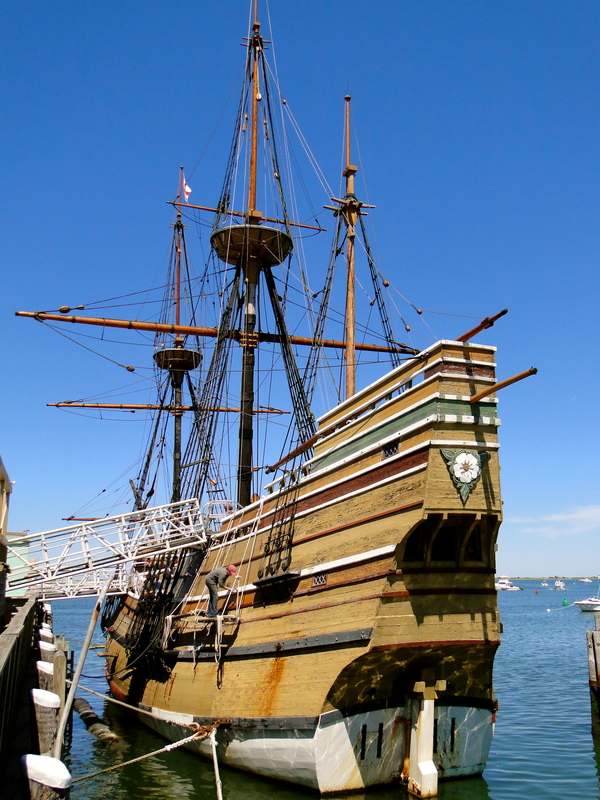 We had a great day exploring including seeing the Mayflower replica and Plymouth Rock. The story goes that the rock signifies the first landing of the pilgrims here in 1620, but I think there are variations of the story and the rock has been moved around a bit. There were many other fee-based exhibits to see here, but we preferred to just walk around and take in the monuments and township. 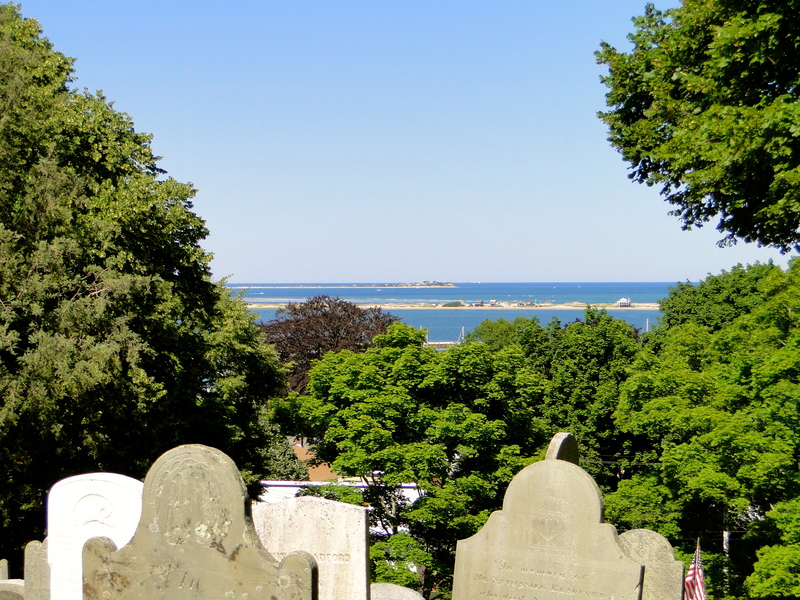 The best view was from the historic cemetery up on Burial Hill where it was clear why this was such a strategic place for the pilgrims to settle. Two long peninsulas on either side protect the bay, with a smaller opening for ships to be able to approach, so they could see ‘em coming! I’m really glad we made the trek up to Plymouth, we almost skipped it. This is where Plymouth Rock is located, shadows prevented us from getting a good shot of the rock itself. View from Burial Hill. You can see the overlapping peninsulas and the narrow entryway for ships. 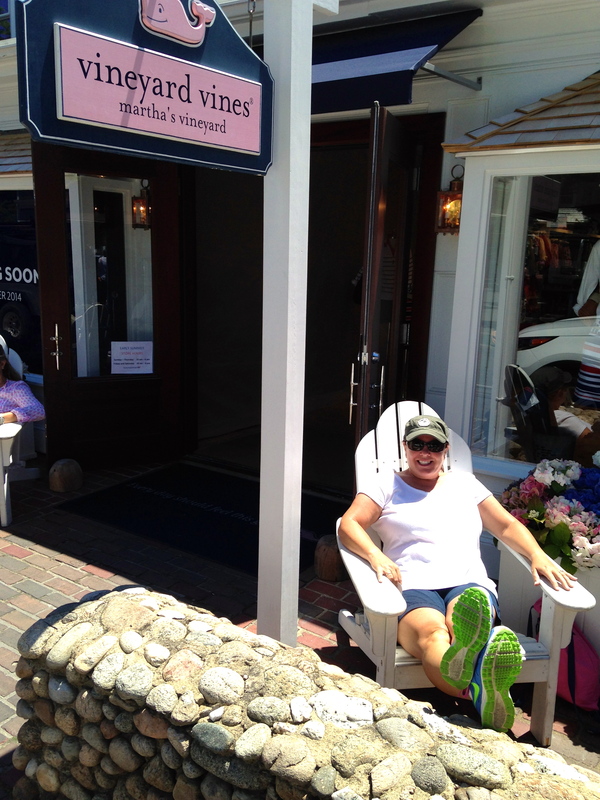 On our last day, we planned a day trip to Martha’s Vineyard. 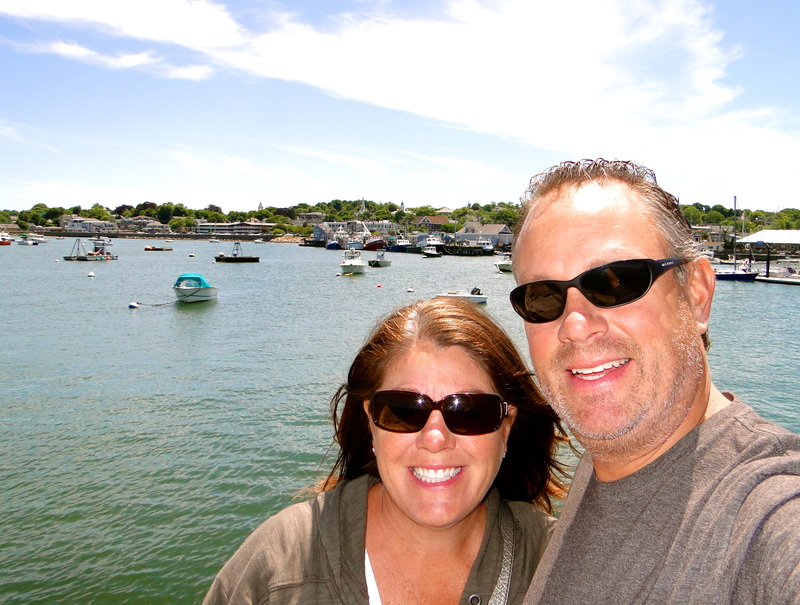 We had made reservations a few days back on the Hy-Line ferry out of Hyannis Port, about a 15-mile drive from our park. They had all kinds of options, high speed or traditional with trips to Martha’s Vineyard, Nantucket or both. We opted for the traditional ferry to the Vineyard only as we didn’t want to be rushed trying to do both islands in one day. If we had more time, we would have planned a separate trip to Nantucket. It was $86 for roundtrip tickets with our bikes which is the least expensive option we could find without having to drive all the way to Woods Hole. We were up early to catch the 9:25 ferry, for an hour and 40 min. crossing. 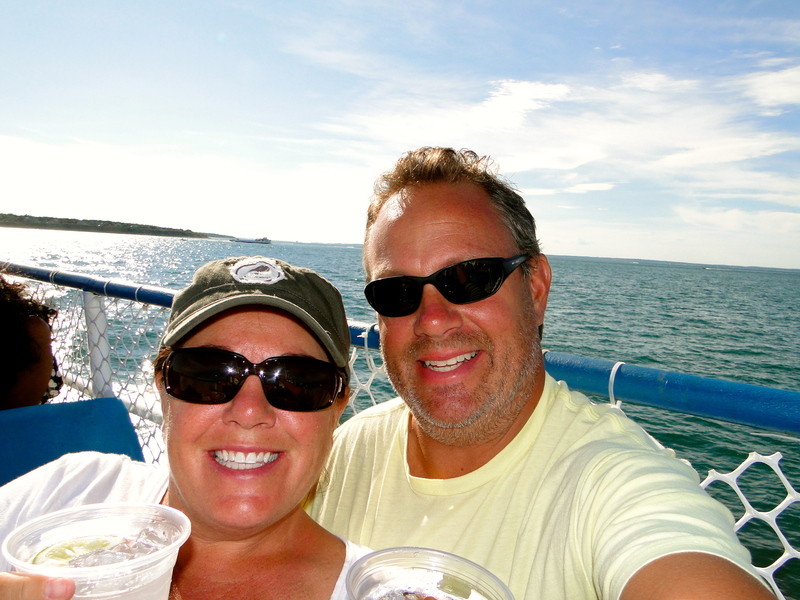 The day could not have been better, as Mike said, it was a “Chamber of Commerce Day.” We found a few seats on the upper deck and enjoyed the crossing through Nantucket Sound. 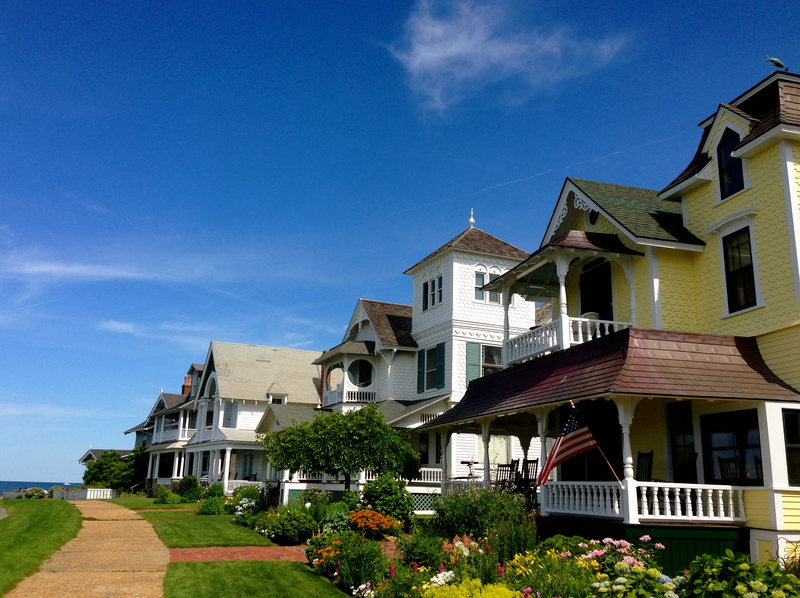 The Vineyard is made up of 6 towns; we landed at Oak Bluffs, which I think is the most touristy of the bunch. 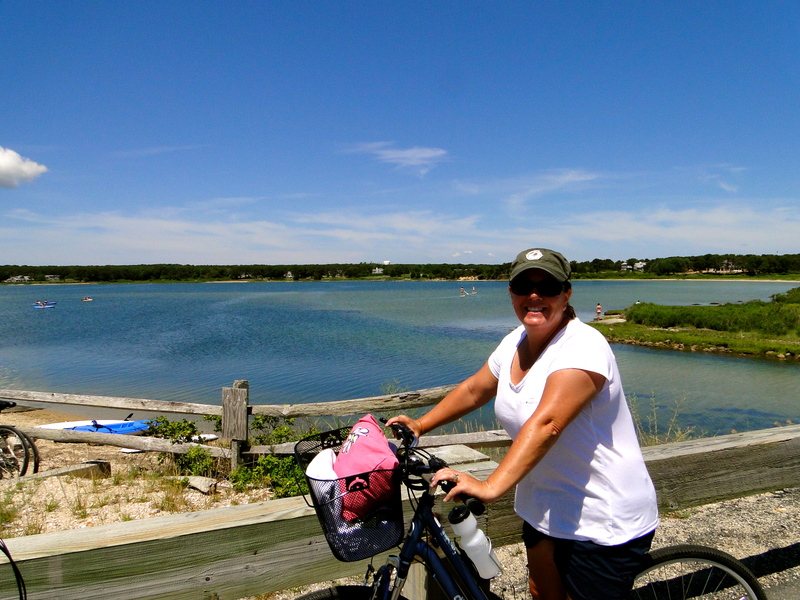 We got on our bikes and headed out to Edgartown, about a 5-mile ride, much of it right along the beautiful coastline. I was surprised by how turquoise blue the water was. It was a Saturday, so the beaches were pretty full up. 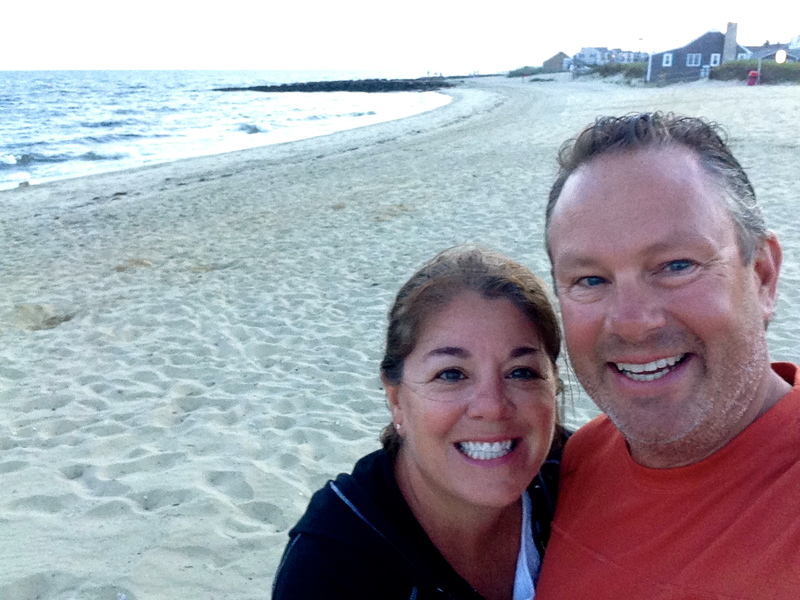 We were both a bit sweaty and fatigued by the time we arrived in Edgartown. We locked up our bikes and decided to get lunch and a refreshment to reward ourselves for the ride :). We then walked around town and stopped in some shops, most of which were pretty high-end expensive. It was then time to make the ride back to Oak Bluffs, where we parked the bikes and explored town a bit. Beautiful homes with amazing views. We had about an hour before the 5:15 ferry departure, so we found a patio bar on the marina and just sat and watched the activity. 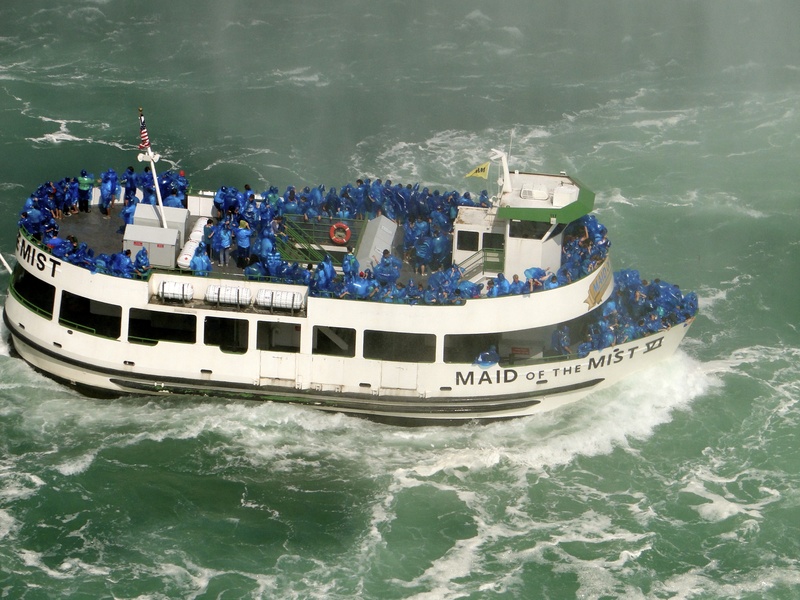 It appeared that there were either tourists like us, or locals who all owned boats and came in from the Cape for the weekend to stay at their vacation homes. Wish we were on the latter end of that equation! The ferry ride home was gorgeous and we again sat up on the top deck to take it all in. We arrived back in Hyannis around 7pm and found the best little Italian joint for dinner, Four Seasons. It was a great day. 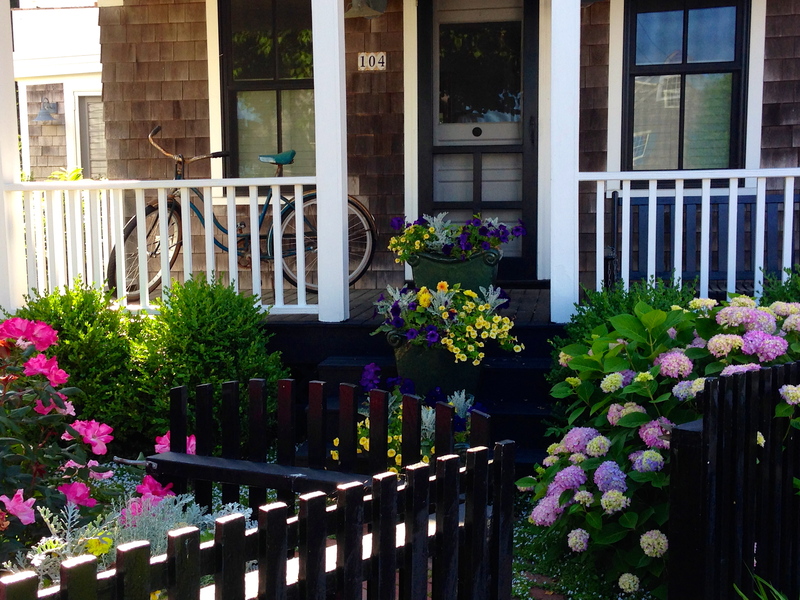 I had always dreamed about riding a bike in Martha’s Vineyard. We’d love to come back someday and explore some of the other towns that may not be as commercialized. We ended up riding 14 miles on our bikes, so we both slept well! I realize that for seasoned bike riders this is not far, but we are newbies getting back into bike riding, so it felt like a lot to me. 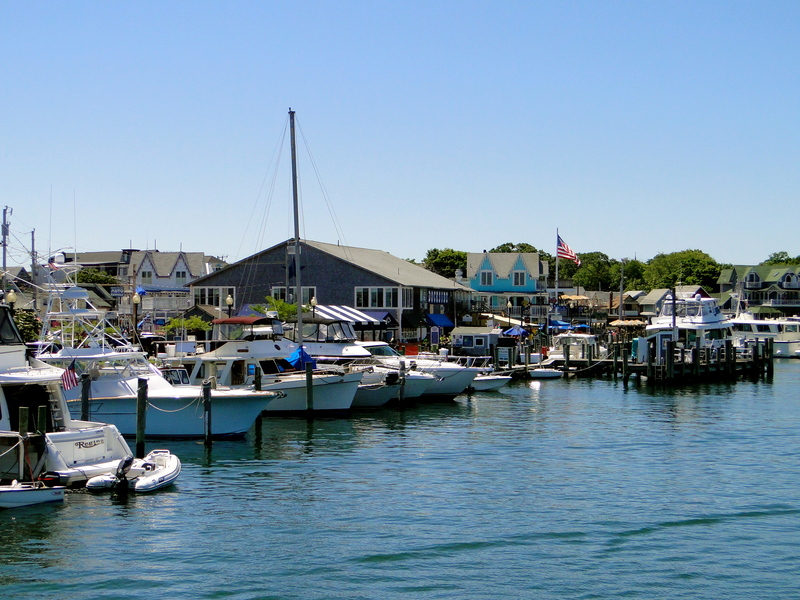 Did you know…Jaws was filmed in Edgartown, Martha’s Vineyard?! 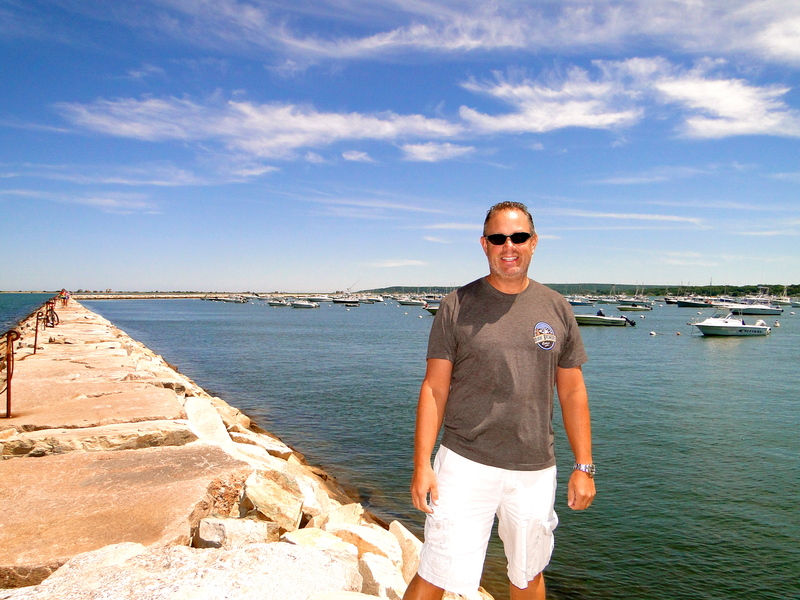 This entry was posted in June 2014 and tagged biking, Cape Cod, Jaws, Martha's Vineyard, Plymouth Rock, Provincetown, World Cup on June 29, 2014 by Traci.